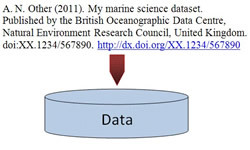 The British Oceanographic data Centre (BODC) announce the launch of an operational prototype Published Data Library. This provides snapshots of specially chosen data sets, archived using rigorous version management. This enables citation of the data set in journal papers through the assignment of a Digital Object Identifier (DOI) in collaboration with the British Library. The PDL is for the publication of fixed copies of reference data sets so that they can be re-used and cited over an indefinite period of time. There is a fundamental assumption that the copy of the data set will be exactly the same each time it is referenced. It should be noted that the assignment of a DOI is not a substitute for long-term data management by the NERC data centres, which enables users to construct their own data sets from all data holdings. Data sets that have not yet been ingested into the BODC system, but are destined for future ingestion. Candidate data sets will be identified through discussion between data originators and the BODC data scientists responsible for the data. The data originator has full responsibility for providing data and metadata that meet the technical quality standards. BODC will judge the acceptability of data sets in terms of their completeness, but not in terms of their scientific quality or value. Data sets that have been ingested into the BODC system and subsequently exported. Candidate data sets of this type will be identified through discussion between the scientists who supplied the data and the BODC data scientists responsible for their ingestion. The technical quality of these data sets is BODC's responsibility. Data citation is an exciting and rapidly evolving area of science publication and it is likely that the approach will take time to mature. While we aim to provide an efficient service, a heavy takeup for publication will inevitably take time to process. To help everyone, we would be grateful if contributors to the PDL plan well ahead, contact us early and take time to become familiar with the necessary requirements for submission. Work is continuing in this area as BODC are committed to improving the services we provide to the marine community.